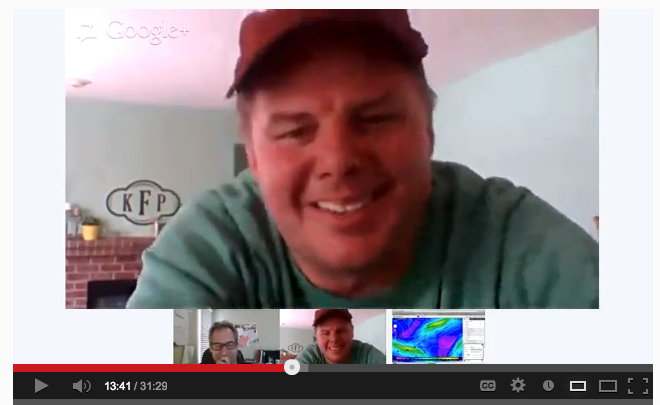 On Sunday, TMF conducted a Google Hangout (video interview) with KSTP TV morning meteorologist Patrick Hammer. Patrick offered his perspective on weather forecast philosophy as well as a few thoughts on what might be in store for the Twin Cities Monday p.m. into Tuesday (hint: snow). We think you'll enjoy hearing Patrick's perspective -- much more than you will his forecast. Thanks for taking the time to go over the latest forecast and forecasting in general. I enjoyed both the casual conversation and the in-depth perspective. I know it is not easy to come up with the time for this - but this April warrants it. How's this for timing? Monday's Twins promotional giveaway at Target field against Miami (4-22) is a rain guage. Not making that up. Pretty good chance the game gets rained/snowed out. Thank you Patrick for excepting the invitation, very informative. Turning to the latest winter storm. I believe that the metro will be under a Winter Storm Warning when most peeps get up in the morning. Going with 5-9" widespread over the metro...Please make it stop!!!! If MSP sees 8" this will be the snowiest april ever. Oh my! This is unreal. I have always said that if it is going to snow then Bring It. Looks like another Bring It storm. Yikes! I can't keep up with clean pants!!! Awesome video!! !.....thanks for coming on Patrick and talking weather. Speaking of weather..WTF happened overnight?........went to bed and NWS had 2-4" and wake up and were under a winter storm warning for 6-10",WOW!...let's break that April record and go out big I say. beat me to that @big daddy.. could not believe the change in forecast. oh well. Oh my! NWS forecasting thundersnow!! In late April,crazy weather! I love snow...but this time mother nature can shovel my driveway...im done with it. Here's to the last significant snow of the season.....btw, with all this late season snow it blows away all those predictions you posted back in October,the closet at the moment is Dave Dahl who predicted 61"(current MSP total is 63"),but if we get what most everyone is forecasting tonight even he would have missed by a good 10+ inches. Thanks for the info, Big Daddy! I'm been busy with my day job so haven't had to amass this info like I usually do. I did hear Mike Lynch say on WCCO (at 8:15 a.m.) that he expected 6-10". He also talked about it as a given/guarantee that the Twin Cities would break the April snowfall record. I was surprised by his sureness about the whole thing. Take heart: it's looking like 70s by this time next week. About damn time. "this time mother nature can shovel my driveway" Ain't that the truth! This snow is going to feel like CEMENT, and my back can't take it anymore! My prediction: 7" of new snow, and it will be gone by Wednesday evening! Yeah, but Dave Dahl's blog last night said several more inches could fall Wednesday night or is that not happening anymore? Nice graphicast on the NWS site showing what will likely be a very sharp gradient b/w heavy snow and heavy rain. So SE metro could be 1-2" and double digit totals are possible to the NW. So we should have 4 days of Spring later this week, with Summer by Sunday. NWS has added an update to their CWA discussion from this morning(about an hour ago)......basically it says high end potential of snowfall still exists, they are seeing on their short term models a mesoscale heavy snow banding running along a Mankato to Twin Cities to Rice Lake line and go on to say 8-12" looks likely in that band......they also warn about a very tight gradient on where that rain/snow line does set up and even mention they will "miss" on the forecast in some areas because the gradient could be 7-8" snowfall across one county,they stress this will certainly happen in St.Cloud and even some western TC metro areas......to me it sounds like if your NW of the loop snowfall rates will come down which is interesting because it goes against what Dr. Novak said in his own video update this morning when he pulled his 6-9+ area down to include the NW metro and said several times more snow NW and less SE....very least this will be very fun to see how it all shakes out.....like I always say time will tell! BTW @Bill.....my weather channel phone app uddated to 5-8"! One more time. 300.00 in fuels / 150.00 in skid repairs/ another 36 hours and we can close out this season for good! I hope all heavy predictions are wrong. So now the snow removal companies are complaining about too much snow? The last time forecasters started increasing snowfall totals every hours in an out-of-control fashion, they busted the forecast. Food for thought. The NW/SE gradient in the snow band is going to be a HUGE issue to deal with. 50 miles either side of the heavy snow axis is likely BUST with little or no snow. Move that axis 20 to 30 miles and it will make a world of difference in the MSP metro. I hope the public understands this issue. This is a true nightmare for weather forecasters. With that being said, I still believe that the axis will lie from near New Ulm to Maple Grove to Spooner, WI. That would place the NW 2/3 of the MSP metro in the 6"+ of snow and this would include the downtown areas. Once you head into Dakota county, amounts will rapidly decrease. I could see 6" near Eagan and 1" in Cannon Falls. Same story as you head NW of the metro. Monticello will get 6"+ while St. Cloud gets an 1" or so. This will definitely be fun to watch! Most of the models are still putting that 850mb 0 Celsius line somewhere between Hastings and Red Wing and extending SW/NE. They added Goodhue County to the warning so it will be interesting to see how soon this turns to snow. NWS now says in their CWA discussion that there's a slight eastward shift of the heaviest snow, saying that the east metro is now the bulls eye where double digit snowfall could occur........time wil tell..........they also say twice that were 3 1/2 days away from spring(sounds like their sick of this weather). Light snow now falling in Golden Valley! 36 and steady light snow in St. Paul at 5:15 p.m. Nothing sticking yet. Moderate to heavy snow in Golden Valley.....coating on the lawns! Just heard a crack of thunder in Otsego. Winter's last rage. Awesome! Mixed Precip in Red Wing. Grass is started to get covered. Nothing but wet on the pavement. Look likely that high end numbers will bust from the loop towards nw metro, heavier banding setting up south and east of metro,also looks like precip moving thru pretty quick to get higher numbers. Moderate to heavy windblown snow continues in Rosemount. We have a solid 1.5 inches so far. Solid 2-3 inches at least in Carver County. The changeover started around 2:30, with the snow starting to pile up quickly after 4:00. It does look like the heaviest bands will be east of us (Thursday they were on top of us). I'm fine with that. 1.5 inches in Highland Park at 7:45 p.m. Your big winner will be south of metro(Red Wing area) and east(Hudson area) heavy banding setting up for those areas.Mother nature throws a curveball again at Dr.Novak,he did say the northwest metro would get the most,right. 3.5" in Burnsville since 5pm! Heavy snow axis has set-up from Mankato to Bloomington to St. Paul to Stillwater. This makes a HUGE difference since it places the heart of the metro, including Dakota county, in the heaviest band of snow. Looks like Monticello southeast to Farmington is where the 4"+ band of snow will lie. The 20 to 30 mile shift further south of this snow band sounds like splitting hairs, but it is noticed by the public when this occurs right over a large metro area. Nobody would notice if this occurred in rural MN. This is nothing like last Thursday,pavement is just wet and the intensity of the snow is a lot less,I had inches of snow on the pavement last Thursday.I live in the northwest metro-Maple Grove. The pavement is definitely in business here in St. Paul. It looks like this storm belongs to the SE metro. However, we did pick up a little over 7 inches the other day here in the SE metro. Everything is white, including the roads. It continues to snow heavily here near Farmington. Heavy Snow now in Red Wing, has been for two hours. We maybe have an inch on the ground, but it's really picking up and the pavement has just been covered. Roads are also very slick on the sideroads and the mainroads are even quick slippery. 3" on the grass and 1.5" on the driveway in Inver Grove Heights through 9:00 pm (northern Dakota County). Just about 4 inches in Rosemount. Windy with heavy snow! You're living right in Rosemount! An even 2.5 inches in St. Paul. Long time reader, first time poster. I live in rosemount. Just took a few measurements and all came in between 5 and 5.5. Never seen anything like this in April. Love all the analysis you guys do. This site is not only a public service (since you guys seem to explain things better than the local mets) but incredibly education and borderline entertaining! Thanks for allow me to join in this community. Nice to hear from you Jake, and thanks for the feedback. Hopefully, we can make it more entertaining. :-) Please contribute questions, comments, etc., as you feel inclined. Couple inches here in S. Mpls. Strange, 1/4 inch in Minnetonka. Side Roads are slop covered with blacktop showing through in many places/ highways just wet. Wet sloppy snow coming down with a fresh breeze. 1.9 inches on grass. This system took a pronounced shift to the east and south, all yesterday and today you kept hearing north and west of the cities will get the heaviest, this is eerily similiar to last Thursday where the northwest metro will get more and there will be a sharp gradient to the southeast. Well that flipped on a dime! Monkey wrenches get thrown in snow events all the time, I just like to hear from the mets that it happened instead of trying to tell you well a dry slot here or a dry tongue there or a tight gradient here or a shift there. How about you just say Mother Nature screwed me and move on! It's mor helpful and interesting to know HOW Mother Nature screwed you over, however, which is the point of giving those explanations. If you guys want to help the broader weather and scientific community, consider joining CoCoRaHS. CoCoRaHS.org Also, if you have a smart phone (Android and iOS), get the mPING app and let researchers know what precipitation type you are getting. Winter is officially over! (by my standards which mean nothing at all) ¼ to ½ inch of slop on the hard from Eden Prairie to Golden Valley and St. Louis Park to Orono. I know, I measured the slop myself with a tape on each site! 2” inches on the grass. I do not worry about the little snow shower on Wednesday. Put a fork in it. It is DONE! Definitely no bust here in Faribault! About 6 inches of snow here this morning in Faribault proper. We've got trees hunched over and light poles tumbled with the weight of the heavy snow... and power was fluctuating through the night. Can't imagine how much we got if you factor in compaction/melting! We got a solid 6.5 inches of snow here in Rosemount. It makes for a beautiful picture postcard scene. I went out and took pictures and video this morning before work. I feel this is Mom Nature's last winter hurrah this season. As a snow lover, I think she went out with a bang! Now, onward with warm, sunny weather so we can finally start our softball season! 5" or so here in Burnsville, maybe 6" if you take compaction into account (I measured 4" at 11PM and 5" at 7:30AM). Lots and lots of branches bent way over and one 4" diameter branch on a tree in my front yard is snapped off. Joe Bastardi has called this the year without spring. I think NWS might agree with him. VERY WELL BE OUR FIRST 80 DEGREE DAY SINCE LAST FALL. I measured at 6 inches at 6:30 am. I'm 5 miles due east of Stillwater. Very interesting phenomenon I noticed today. I believe due to the higher solar energy we receive this time of year, it is EXTREMELY bright outside with this new snow. I'm trying to calculate the exact number, but it's complicated. OK, I figured it out. There's a great solar radiation calculator at nrel.gov. Lowest day of the year: 12/21, we are are receiving about 519 watts per square meter at solar noon. Today, 4/23, it's 1142 w/m2. So that is 2.2 times what is called the Extraterrestrial Global Horizontal Solar Irradiance that we receive on the winter solstice. The maximum is on 6/20 at 1228 w/m2. So we're really not far off from the max solar energy we receive. So no, it's not just my imagination that it is blindingly bright outside. Interesting stuff, though I'm surprised the radiation on 4/23 is that close to 6/20. I find it interesting that the sun's slant (angle) is the same now as it is in mid-August! I was kind of surprised about that too, but the range really isn't all that wide. Here's an excel chart I made. January 1st is at the far left, Dec 31st at the right. Correct. The altitude at solar noon (1.10pm at Minneapolis) is 57.8°, about the same as on August 18th. Disco 80: I love it! Now calculate the 'albedo effect' of the snow's reflection and combine that with the solar radiation. The brightness number has to be off the charts! I thought about that, but I don't think snow albedo would make a difference. That is, it's the same albedo now as in December. The difference is in the solar radiation. I love how this storm forecast, and the past several, have been on the money. When you consider such a tight window of where the heaviest snow will fall and attach that to sun angle, late-April, warm roads/ground, the believability factor, and the variety of model runs/variations, I have been very impressed. The response from the general public to forecasting snow versus the forecasting for severe weather is so very interesting to me. When a forecaster says that "conditions are ripe for severe weather" and "be prepared.....there could be," people make note, but they are happy when it doesn't happen and are not loud and outspoken about a busted forecast. When a snow forecast is "off" the criticism is so high even though most are happy it didn't happen (especially in April)! I get it that tornadoes and severe weather are scary and that we can be mostly safe in big snowstorms, but then the response should be even the opposite as far as criticism is concerned. The "happy factor" I get, but it seems like the more "scared" you are, the more critical/cynical you might be when it doesn't come to pass. Also, with rain/severe weather, a forecaster doesn't need to give an amount of rain. Most generally give a ballpark. "It could be an inch or two of rain." That is a lot different than saying 1-3 inches of snow or 6-10 inches of snow. People notice it because they see the snow laying in their yard, but they don't see the rain unless is it flooding something. Random thoughts on the response of people to weather forecasting. By the way....no more bringing it. Bring it to spring/summer!! Weather measuring instruments collection for weather reporting wind measuring is a vital factor. So to measure wind speed you need accurate gadget, only from a reputed shop you can collect them a branded and genuine meter otherwise your result will show error. Collect them from a weather stationery shop for getting accurate result.